A few days ago I recorded a podcast with Warren Littlefield, the former entertainment president of NBC and the man who, in the ’90s, oversaw the last great era of Must See TV. The pod will be posted in a few weeks, but one thing he said seemed particularly relevant to last night’s slate. While Warren agreed that The Office, in its prime, was a worthy successor to Cheers and Seinfeld as the 9 p.m. “tentpole” of a night of sophisticated comedies, he used another term to describe the fringier pleasures of shows like Community and 30 Rock: “velvet rope.” He was in no way disparaging the quality of either series, just pointing out that both maintain an air of exclusivity to their humor, that life in a boring yet familial workplace might prove slightly more universal and relatable than, say, the continuing adventures of a man who transports a pregnant snake in a casserole dish. The television landscape may have changed radically since Warren was in charge, but the mission remains the same for current topper Bob Greenblatt: Expand the audience, don’t limit it. But here’s the thing about velvet ropes: They can be pretty awesome depending what side of them you’re on. And as 30 Rock returns for a shortened final season, it’s clear that showrunners Tina Fey and Robert Carlock are primed to throw a Marquee-size final bash, guest list be damned. I’ve written a lot over the last two weeks about how an execution date freed The Office from cryo-freeze and empowered it to tell the few stories it has left. 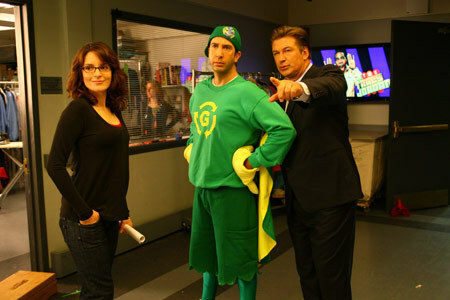 In the case of 30 Rock, the sense of an ending can also provide permission for an already out-there show to fly its freak flag even higher. “The Beginning of the End” — a great title, on loan Lt. Dan Band a full hour of late night. Turns out, Jack is playing God with the schedule (he’s also playing God for real on NBC’s new God Cop, which, truth be told, looks 100 times better than Chicago Fire), “steering the Titanic into the iceberg” in a desperate attempt to finally make it to the CEO table, away from the “women and nice men.” Liz, quite rightly, wonders if the tanking has been going on for seven or eight years. Within the world of the show it’s always been seen as a minor miracle that The Girlie Show has remained on the air but, in reality, the same could be said for 30 Rock. It’s long been a lonely, functioning vending machine in the larger prison of NBC’s schedule and now, with Bob Greenblatt’s new mandate for “broader” humor, its time has passed. It will be interesting to see how virulent the invective gets in the 12 episodes remaining — there are still plenty of other loose ends left to address, like Liz’s potential motherhood, and whether or not Kenneth was ever able to kill that sturgeon. But the shift from gentle, Greenzo-esque corporate mockery to full-on calling NBC a “money-losing embarrassment” was as eyebrow-raising as it was funny, like the condemned man giving a middle finger to the firing squad — only he wasn’t so much condemned as old, successful, and happy, and it wasn’t a firing squad as much as it was a gentle passing in his sleep. Good luck to you, 30 Rock, with this risky line of attack! Good luck and good Peacock. Everything else, well, it was more of this season’s ongoing gentleman’s B. There was so much funny around the edges — Erin imagining asking Michelle Obama “what war to do,” Darryl’s deadpan delivery of “Tracee Ellis Ross” — that it’s hard to find too much fault with the center. Jim’s secret in Philadelphia — no, not the burgeoning psych-rock scene, the other one — is still more than a little vague. (Is “sports marketing” really that easy to get into?) But, as with Nellie’s pantomime, the goal here isn’t accuracy, it’s enthusiasm — and it’s finally evident in the halls of Dunder Mifflin again, from Darryl’s professional aspirations to Dwight’s full-throated recitation of the Dothraki phrasebook. I’m even leaning toward preferring Dwight’s anti-French joke (“a great language if you’re a chain-smoking acrobat”) to Tracy Jordan’s (“how nice to meet a woman who speaks the language of the Nazi’s most enthusiastic collaborators!”). Too bad, then, about Andy Bernard. The character was introduced as an entitled rage monster, then softened into a sort of amiably dense Michael Scott–lite. I appreciate him getting his claws back, but the meanness — dismissing Erin (and pushing her into the applauding arms of the new guy), using Darryl’s smart paperwork as a coaster — doesn’t work when coming from the big chair, even when you leave aside the croquet of it all. The Bernard family may have always been “moral middlemen,” but we need something stronger in the regional manager’s office — and at the top of the call sheet. Don’t get me wrong: There were plenty of amusing grace notes, from the Dixiecrat councilman’s platform to de-integrate baseball (“You’re outta here!”) to Jerry attempting to manage a breach birth by telephone (and not interrupt Donna’s light reading in the process). And I’m very much enjoying the committed pairing of the show’s most uptight character with its most destructive; even unfeeling Data would cower from April’s eyebrows. The Leslie Knope “Fun in the Sun” act was a victory for democratic process, and the b-story, featuring guest Lucy Lawless, was a clear win for Ron Swanson’s love life. But as an episode of comedy, it felt more like a filibuster. The opening of “Swingers” was the best Up All Night has been since Amy was teething. The sudden loss of the TV — and the sweet escape from reality its “reality” provides — sent Chris and Reagan into a very funny, very finely observed comedic tailspin, juggling remotes and realizing their dinner table has become a depository for lost dreams and unopened Zappos boxes. It was small-stakes, yes, but it was focused and felt true. It seemed like a workable model for the show Up All Night desperately wants to become. That’s a genuine compliment toward a very frustrating series, but sadly it’s the only one I’ve got in my spare bedroom this morning. (It’s mostly full of pre-used yoga balls and rain sticks.) The rest was as maddeningly wifty as ever, with Chris and Reagan desperate to prove their fading coolness by attending trapeze school. But, much like their show, the two crumble at the sight of real risk and end up cuddling in the safety netting rather than taking a giant leap. In the b-story, Luka Jones’s brother-in-law (it should tell you something that I can’t even remember the character’s name) remains as compelling as an elderly couple at Waffle House, smiling blankly and saying things like “Craigslist is kind of my jam.” (I don’t blame Jones, as it’s hard to play with nothing. What could the casting sides for this role possibly have said? “Wanted: actor with pulse?”) And Maya Rudolph spent her screen time menacing Rachel Dratch for a ceramic mug. I’d come up with a joke for how incredibly inessential this story line was — it would be a whole lot better if Ava were either a genuine celebrity or a certifiable lunatic instead of this champagne-soggy middle ground — but if the writers aren’t going to bother, then I’m not sure I should either. Grantland Reality Fantasy League: Shocking Rulings, Drug Conspiracies, and Brazilian Demons!